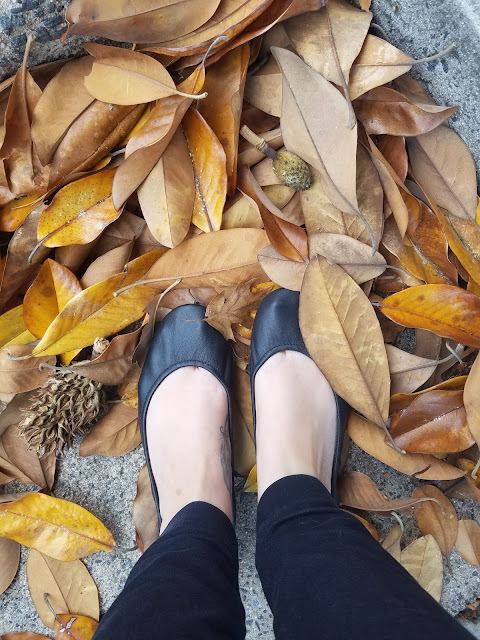 Earlier this year, I wrote a post about my new Tieks, the ballet flat that I’m sure, by now, you’ve seen all over the Internet. Tieks by Gavrieli are the cute, versatile shoes that are taking over your Pinterest feed, advertised to be “The Ballet Flat, Reinvented.” They are also known for being pretty pricey, but everyone who has them swears them to be worth it. Spoiler alert: They are. But how have these shoes held up after near constant wear for nine months? I am naturally a pretty clumsy person and I’ve ended up scuffing the toes of my shoes so bad that the ends of the signature Tiek Blue sole chipped right off. I also had someone at my office rake a door over my soft Italian leather shoes, scratching them. I emailed Tieks customer service asking if there was a way the shoes could be repaired. Instead, they surprised me by offering to send me a BRAND NEW PAIR of shoes for FREE. The catch, of course, was that I send my old shoes back to them, but they sent a pre-paid shipping label with my new shoes, so no harm, and no foul. The fronts of my Tiek Blue soles were beginning to chip from where I had accidentally scuffed my toes. My first pair of Tieks after 9 months of almost daily wear. Yikes! 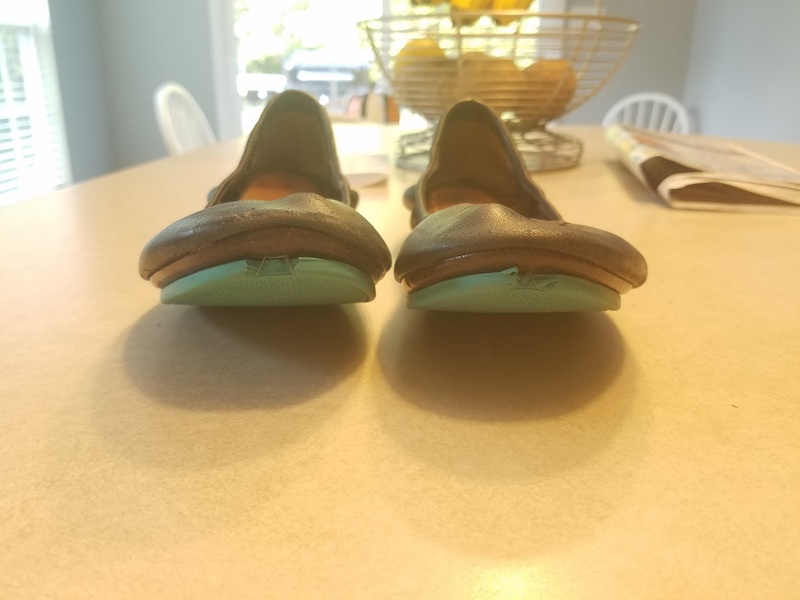 Being made of Italian leather, Tieks do tend to scuff and scratch easily, and they also start to stink if you wear them completely barefoot inside, which I do. 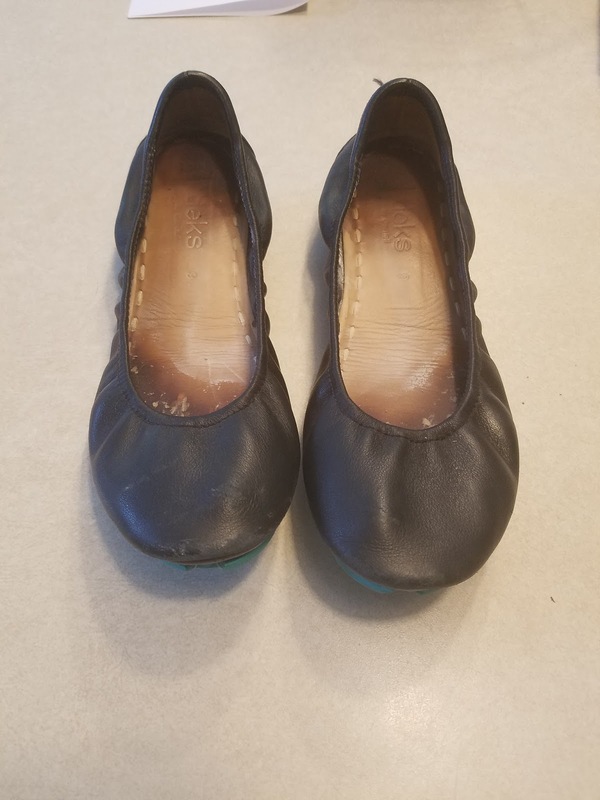 Because I paid (what I consider to be) a lot of money for these shoes, I began scouring the internet for ways to keep my “do-over” pair in tip-top shape. Turns out these are not the kind of shoes you can just wear all day, every day, and expect them to stay perfect – who knew? Not me - Although looking back, it’s pretty obvious that if you spend nearly $200 on a pair of shoes, you should definitely make an effort to take care of them! 1. Like all leather shoes, you should regularly polish your Tieks. Lots of folks online have recommended Tarrago shoe cream. I purchased Black #18 for use on my Matte Black pair. 2. Lots of people use sole inserts that combat the stink that eventually sets in. 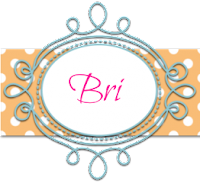 So far, I don’t love the ones I’ve purchased (they stick to my feet), so I will probably keep shopping around to find what works best. Although I don’t love the way these feel, they do a great job of keeping the smell at bay. 3. Many Tieks wearers don’t like the “toe bump” that comes after your shoes become completely formed to your feet. I personally didn’t mind it with my first pair, but I did eventually wear through the first layer inside the shoes. You can simply re-inforce the toe of the shoe with a bit of moleskin if it bothers you. Despite the upkeep issues I ran into with my first pair, I am still 100% here for these shoes. 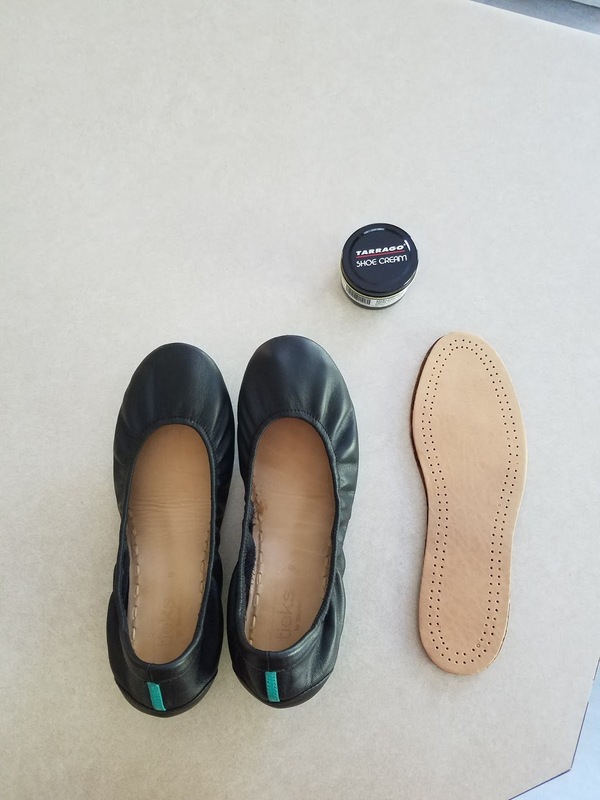 They have survived a 20 hour day when I flew across the country for a business trip with none of the pain or discomfort that usually comes with wearing ballet flats. Hands down, they are my most comfortable pair of shoes and I will for sure continue singing the praises of this company for years to come! Are you a Tieks Girl? Share with us in the comments! I have never owned a pair. They look super comfy! They are definitely worth saving up for! They are my most comfortable shoes by far! I'm pretty impressed to hear about the great customer service from Tieks. I've been wanting to try Tieks, but I haven't taken the plunge yet. Hey Em! 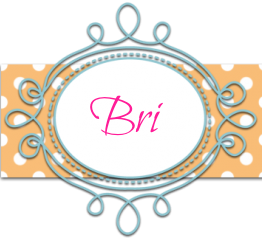 Their customer service is phenomenal! I ordered the wrong size the first time I purchased - I'm a size 8.5 and wasn't sure whether to size up or down. They ended up sending me both a size 8 and a size 9 with a pre-paid shipping label to just send back the pair that didn't fit - FOR FREE. If anything, it's their amazing customer service that keeps me a loyal customer. I know they're always going to take care of me.